Brian Bosworth starts his day with a gluten-free bagel, just like a lot of other people who have celiac disease. But after breakfast, Bosworth puts on his white lab coat and begins his day as a gastroenterologist at New York-Presbyterian Weill Cornell Medical Center in New York City. He is a faculty member in the Jill Roberts Center for Inflammatory Bowel Disease, the director of the gastroenterology fellowship program and is the chair of the medical education committee, which includes serving as the director of the gastroenterology curriculum for the medical students. Bosworth is something of a rarity in the gluten-free medical world because of his own celiac disease diagnosis. To patients who have struggled to find a doctor who truly understands what it means to be gluten-free, this may seem like a dream come true. Although Bosworth’s primary focus is ulcerative colitis and Crohn’s disease, he diagnoses and sees patients with celiac disease and gluten sensitivity. 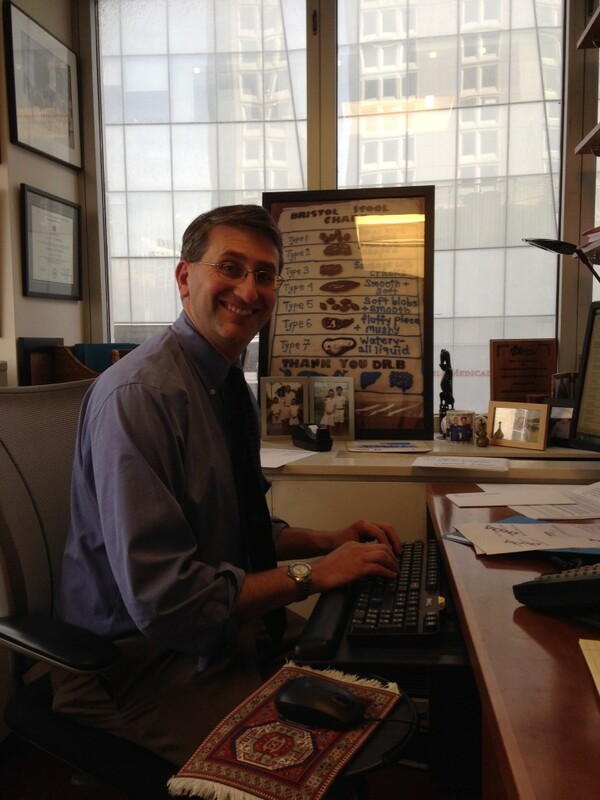 He makes sure the gastroenterology (GI) fellows, medical residents and medical students at Weill Cornell are well versed in celiac disease and gluten sensitivity. Bosworth’s interest in gastroenterology developed before he knew he had celiac disease. In his fourth year of medical school he was drawn to the specialty because of the patients and the procedures conducted and saw his future there. He went on to do a residency in internal medicine at New York-Presbyterian Columbia University Medical Center. In 2002, while he was serving as the chief medical resident and after he had already matched into the GI fellowship at Weill Cornell for the next year, he was diagnosed with celiac disease. “It’s amazing how things work out that way,” Bosworth says. Ever since he’s had a dual perspective of the condition as both a gluten-free doctor and patient. On a recent morning, we spoke with Bosworth about his typical day, which is busy and varied. He is passionate about the practice of medicine and teaching it to the next generation of physicians. And he notes with pride that his children, who don’t have celiac disease, know all about what products to buy if you’re gluten free. Usually around 5:30 a.m. It varies based on what time I have to be in the hospital. If I have to be in for our 7 a.m. Monday conference, I’ll get ready, warm up my gluten-free Udi’s bagel from the freezer and drive in and then go about my day. If I don’t have to be in until 8 a.m., I’ll usually go to the gym in the morning. [One day recently] at 8 a.m. I had a research protocol review meeting that evaluates Institutional Review Boards studies before they actually go to the board. I help to hone them, make them stronger, make sure their questions and end points are appropriate and their budgets are all good. Then I saw patients in the office, and I had [to perform an] endoscopy in the afternoon. I am currently the chair of the committee, in charge of all the residents and fellows at Cornell. I also run the GI portion of the first- and second- year medical students’ curriculum. We just changed the whole thing around this year. When I teach, I start by bringing our traveling endoscopy cart into the lecture hall and show how we use the scopes by cauterizing chicken cutlets that I bought that morning. Then we take a break, and I let the students try out the scopes themselves. I also feel that it is very important for the students to have patient contact, so we invite patients into the class and talk about the diseases from a personal perspective. I mentor a lot of residents and fellows on various projects. I am the principal investigator or co-principal investigator on a number of clinical trials as well as working with our scientists on coming up with clinical questions, obtaining tissue or blood and documenting clinical correlates. It’s primarily focused on inflammatory bowel disease, but we have certainly conducted projects with the folks at the Celiac Disease Center at Columbia University. My staff yells at me that I don’t eat. I usually get an Honest Tea and a Kind bar and that’s usually lunch. There is no time. It’s so busy between seeing patients and spending time with the GI fellows. I wind up having an ice coffee on the way home from work. Is there anything surprising about your day? When people think about doctors, they picture someone who is in their office all day. I am at most in my office for a half a day. One of the most surprising things that has happened to me is that when I came back from skiing a year ago, my office had been cut in half. They put a wall up in the middle with a little sliding door. At first I was taken aback, but I thought, “You know what, I am never sitting in my office.” I am either seeing patients or running here, running there. As long as there is a place to hang my coat and sit down and be able to look at documents on a real screen as opposed to a phone, I’m totally fine with that. I have the office with the smallest number of square feet in the GI division. Do you have a favorite part of the day? My most favorite part is coming home and seeing my two kids. When I’m at work, I would say spending time with patients is just great. Also, being able to do all the teaching, whether for medical students, residents, fellows or running courses for faculty. I think it’s just really fantastic. Tonight we are having people over and we doing a make-your-own Asian noodle dish with rice noodles, steamed chicken, lots of vegetables, fresh peanuts and a fresh peanut sauce. We will have to figure out something for dessert. If all else fails, we have coconut ice cream. We only cook gluten free in our house and almost everything is gluten free. We do have cereal that contains gluten for the kids and my wife. We have a toaster for bagels with gluten, and I have my own gluten-free toaster, plus one cream cheese that is labeled gluten free and one that isn’t. When you diagnose a patient with celiac disease, do you tell them you also have it? I certainly don’t keep it a secret. It just depends on how the conversation goes. I would say more often than not I do. It’s certainly something I have spoken about very publicly. I think that is somewhat reassuring. Right then and there, they have someone they can start asking questions and really begin to think about the diagnosis. I think it’s gotten a lot easier for people to understand in the last five years, but there are still a lot of questions that come up when a diagnosis is made— what it means for their family and their future family. What is it like to be both a doctor for and member of the gluten-free community? I certainly did end up with a personal connection. I hope that makes me more empathetic to my patients, not only with celiac disease but with all the GI conditions I treat, including those that require you to be attentive to your diet. When I talk to patients about it, I talk to them about how to actually live their lives. I think it’s comforting and reassuring to the patients and their families. When you have a gluten-free member of the family, it’s not just that one person looking out for things. You need to have the household aware and able to adopt and adjust. Being able to speak to the patients from that personal standpoint, it’s comforting. You teach medical students, residents and GI fellows. Where does celiac disease and gluten sensitivity fit? I have a whole lecture for the medical students on GI immunology. In addition to talking about inflammatory bowel disease, I have a large celiac disease component in the talk. I go through the difference between gluten sensitivity, a wheat allergy and celiac disease because they mean very different things immunologically. Invariably there are then students who come up to me during the GI section, and they say have something whether it’s celiac disease, or they are gluten-free. The celiac disease community has always been very open. I remember standing at Barnes & Noble looking at gluten-free cookbooks and people were coming up to me and starting conversations about their own gluten-free experiences. May is Celiac Awareness Month. If there is one thing you could share with the community, what would it be? I think it’s important that when someone is diagnosed that they have first-degree relatives screened. Screening is so important because identifying celiac disease early can have important downstream health implications.